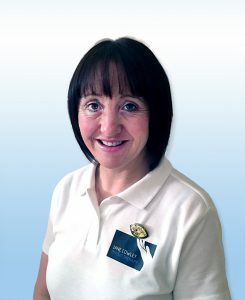 I qualified as a physiotherapist in Leeds in 1997. I worked at Aintree (NHS) Trust and the Walton Centre until 1999 and then Salford Royal Hospitals (NHS) Trust from 1999-2001 combining this with private practice work in Sale, Manchester. I moved into a specialist musculoskeletal occupational health Physiotherapist role at Greater Manchester Police and then returned to the Isle of Man in 2005, where I had grown up. I combined working for Isle of Man Hospitals with part time private work and completed my MSc in Advanced Physiotherapy in 2017 with distinction. I am delighted to be working in private practice again and particularly in the north of the island where I live with my husband Christian and my three daughters. I am registered with the Health and Care Professions Council (HCPC) with registration number PH53008 and the Chartered Society of Physiotherapy (CSP) with registration number 58397. If you see a Chartered Physiotherapist you can be confident of their professional knowledge and skills. Chartered Physiotherapists, through their professional body, have continued to drive the standard of physiotherapy up, seeking and adopting new and innovative ways of working in response to current health and social care reform. All physiotherapists in the UK have to be registered with the Health and Care Professions Council (HCPC). This is a condition of using the title ‘Physiotherapist’ or ‘Physical Therapist’, claiming to be an active member of the profession, and practising physiotherapy anywhere in the UK, whether in the NHS, independent or working in other sectors. The added value of CSP membership is widely recognised by physiotherapists: over 90% of those practising in the UK hold Chartered status. The HCPC is an independent, UK-wide health regulator of specific health and social care professions, including physiotherapy. Is your physio registered with the Health and Care Professions Council (HCPC)? You can check online at www.hpc-uk.org.